Classic Rock was often heralded in by bands whose members were in their early 20’s or even late teens at the time. So it should come as no surprise that a young band is living up to the swagger that precedes them by 50 years, and delivering the goods. 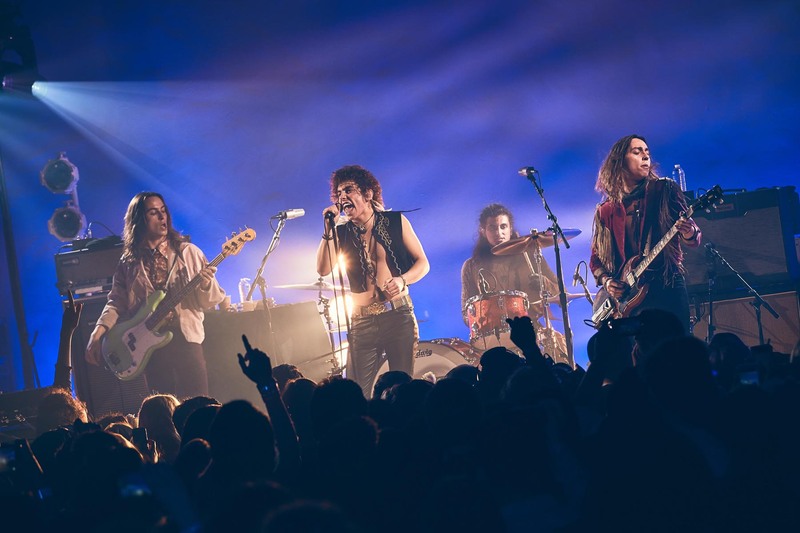 Formed by three brothers and then joined by a longtime family friend, Greta Van Fleet has spent the last couple of years creating a deafening buzz that now sees them selling out medium-sized concert halls before their debut full-length album has even been released. Young teenage fans screech and cry in concert, while plenty of the older generation has been lured in as well, encouraged to discover that some youngsters these days still know how to play their instruments well and can rock ’n roll. New album “Anthem of the Peaceful Army” is not their first recording: an initial 4-song EP “Black Smoke Rising” led to adding another 4 songs to complete a subsequent 33 minute 8-song EP “From the Fires”. None of those 8 songs – many of which are impressive staples of their live set and have already gained millions of views on YouTube and streams on Spotify – are repeated on their debut. This full-length album features 10 songs with 46 minutes of new music, several of which have been road-tested for years during past tours. The new material falls into three general categories: rockers, ballads, and those with a more epic approach. Opener “Age of Man” is in the epic category, a slow burner that holds promise that the band is maturing into deeper directions than some of their shorter songs suggest. The glorious closing progression of the song is truly anthemic, drenched in keyboards and vocal cries. It would be a choice way to close the album, but its positioning as the lead-off track somewhat lessens its impact. Still, “Age of Man” remains one of the best new songs offered here. Two quick rockers are up next, an area in which the band excels and where they have already been building their reputation. “The Cold Wind” is good old rock ’n roll, nothing fancy save for a few choice guitar overdubs, and the kind of rhythm section and vocal wailing that elevates the material from standard to stand-out. “When the Curtain Falls” was an ideal first single off the album, again combining classic blues driven rock with a brief reflective interlude in the middle that chronicles the tale of a Hollywood star whose time has come and gone. Already a winner in concert, this song is a perfect vehicle for the higher end of Josh Kiszka’s vocal range. “Watching Over” moves somewhat back into the epic category, via a tale of environmental devastation. One of the highlights of the album, the band’s performance contains an emotive guitar solo from Jake and a growing intensity punctuated by Josh’s truly moving vocal delivery during the last minute of the song. 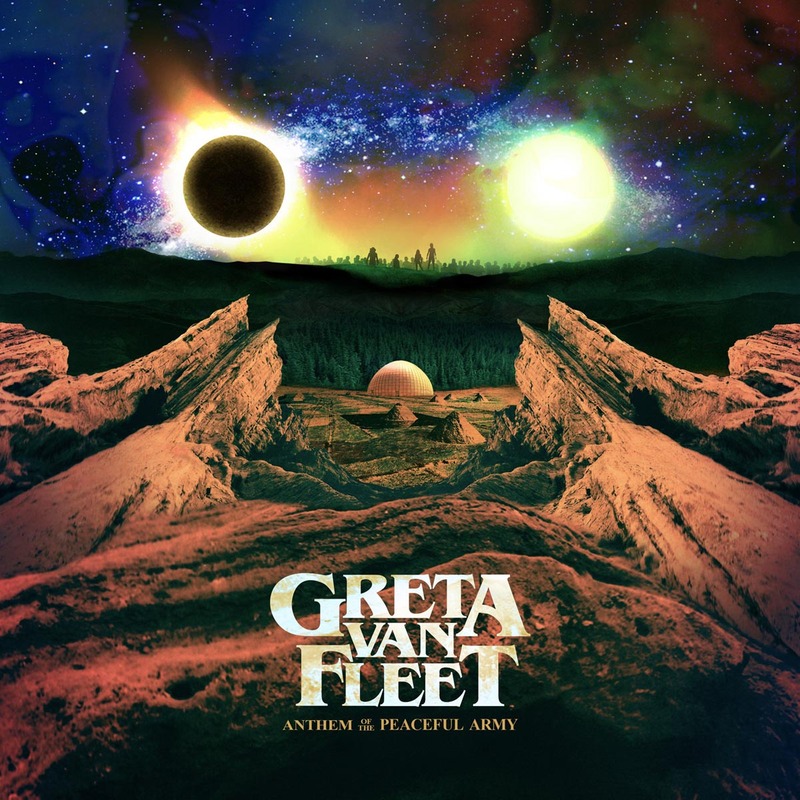 “Lover, Leaver (Taker, Believer)” then takes Greta Van Fleet’s performance up a notch higher, stretching out over 6 minutes of bluesy jamming, and a moody middle section where Jake’s lead guitar intertwines with Josh’s vocals to a thrilling climax. Throughout “Lover…”, and the tracks which precede it, the music is satisfyingly supported by Sam Kiszka’s solid bass groove and especially Danny Wagner’s driving pounding on the drums. It takes a rhythm section like Greta’s to make rock truly roll, and these guys deliver. At the half-way mark through the album, the listener has had few moments to catch a breath. The band has already built upon their excellent EP which preceded “Anthem of the Peaceful Army”, delivering winning track after track, and giving hope that their future will continue to evolve at a rewarding pace. A lighter moment comes in the first proper ballad, “You’re the One”. This acoustic number sounds great from an arrangement standpoint, with Sam Kiszka adding a classic touch on the Hammond organ. Josh’s voice finally gets to shine at a lower register than on most of the other songs, which would be a welcome addition on more places on the album. Unfortunately, the structure of the song treads precariously close to their own ballad from the previous EP – the far superior “Flower Power”. This fact makes the sappy chorus of “You’re the One” seem a wasted opportunity. For the most part, Greta Van Fleet’s material transcends their age, but this ballad doesn’t show much depth musically or lyrically. Fortunately, it’s a rare exception in their repertoire. The acoustic guitars stay in the mix on “The New Day”, providing a catchier feel-good approach in shaking away the darkness of the past and welcoming in the shine of the new day. It’s a song that reflects the band’s sense of positivity and love, which is one element that makes Greta Van Fleet special. This vibe continues on “Mountain of the Sun”, an upbeat love song with a great chorus and slide guitar. The listener starts to take in the essence of the band and their choice of album title “Anthem of the Peaceful Army”. A darker turn comes with “Brave New World”, both sonically and lyrically, beginning with a meditation on our impact on the earth, but still offering hope: “…Turn back the clock within your glass of sand/To a time of love within this blackened land/A silent child climbs a mound of char/ Where he plants a seed that grows beyond the stars…”. The album finally closes with a sweet ballad, simply called “Anthem”. Jake’s philosophizing is intentionally kept simple and sweet: “…Just you and me, can agree to disagree, That the world is only what the world is made of,…” sung as a group chant to sweet reverb-drenched slide guitar and hand percussion. Considering that the second half of the album isn’t quite as strong as the first, an alternate tracking order could have made for a more rewarding complete listening experience. Minor quibbles aside, there is one led elephant in the room that hasn’t yet been addressed: similarities to a certain other classic rock band who are hallowed ground for so many music fans. As Robert Plant said (albeit with a different meaning): “You know what I’m talkin’ about.” Well, we could just sidestep the issue by observing that Greta Van Fleet cite their influences as including many of the same blues-men that actually inspired Led Zeppelin in the first place…for instance, Greta Van Fleet play covers from Howlin’ Wolf in concert…which can sound to our ears like a whole lotta Zep. But there’s little doubt that each of the members of this band will remind the listener directly of their counterpart: the fills of Bonham, the low end of Jones (AND his organ playing to boot! ), the riffing of Page and the wailing of Plant. Suffice to say, fans of Led Zeppelin I and II will find much to love in Greta Van Fleet. But truly, fans of most blues-based classic rock will cherish this young band, sensing they’re on familiar ground and yet enjoying fresh material played in a way they can relate to. It’s not revolutionary, but it does satisfy tremedously. Greta Van Fleet is a shining star at the moment, a return to real instruments played with passion, joy and love. Long live this new Peaceful Army!